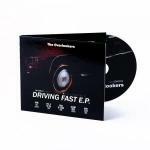 THE OVERLOOKERS: DRIVING FAST EP OUT NOW! The debut single by The Overlookers is now available! A 5-track limited edition CD Driving Fast EP is available with exclusive bonus and remix. The 4-track digital version is also available on usual platforms, except iTunes that decided to ban the record, offering The Overlookers their first forbidden record! You can already listen to Driving Fast on our YouTube channel!